It's a question every char koay teow fan wrestles with at one time or another. 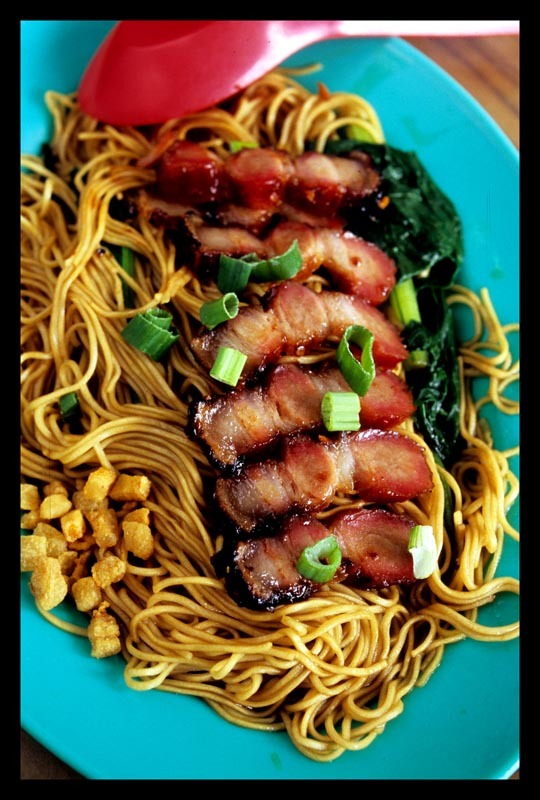 Is this unofficial Malaysian national dish of stir-fried wide rice noodles best generously sauced and tinted an even black-brown? Or should it be taken light of soy and pale of color, every speck of wok hei'd char visible to the naked eye? I have long counted myself among those who adhere to a preference for the latter. The inspired versions of char koay teow served here, here, and here had me convinced that light and dry is best. 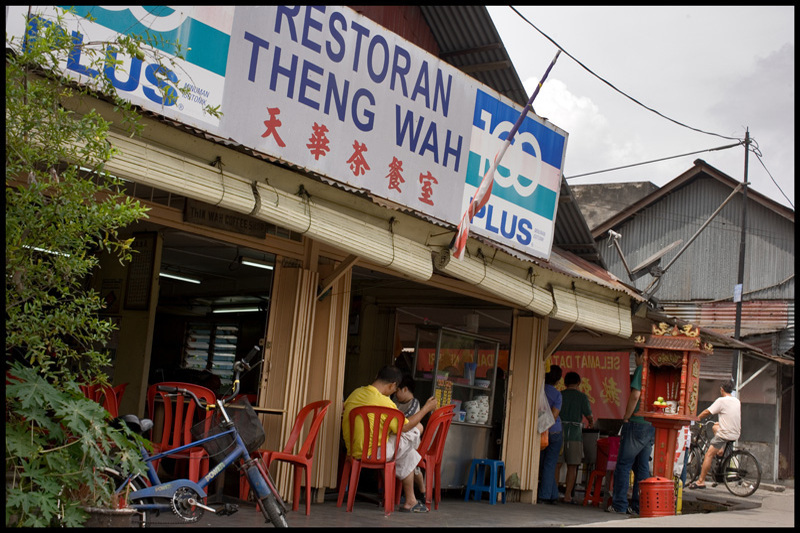 But a recent lunch at Jalan Klang Lama (Old Klang Road) stalwart Restoran Theng Wah made me rethink my bias. I flirted with the dark (and wet) side, and it tasted pretty good. 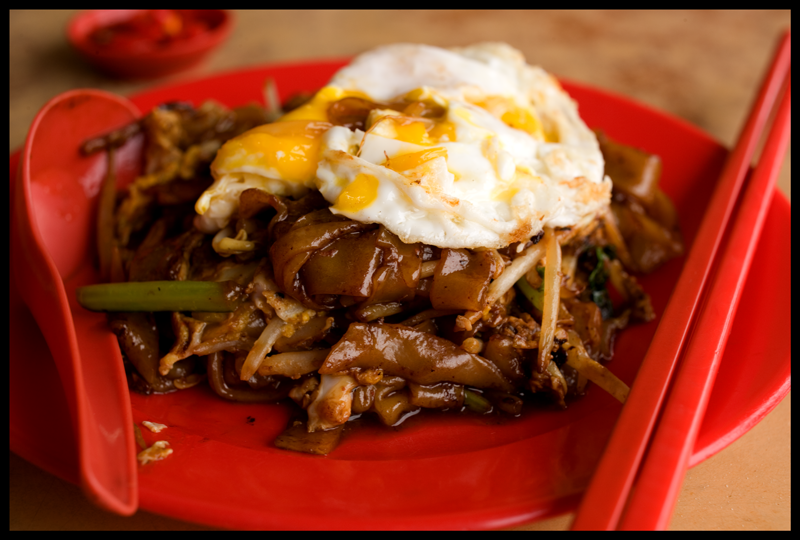 Purists may argue that the noodle dish pictured up top isn't a true char koay teow. Though it incorporates the required blood cockles, eggs (light, fluffy, and left in big pieces rather than broken up), bean sprouts, and pork (char siew, in big, rustic, rough-cut slices), this version omits prawns, adds choy sum (Chinese mustard), and is served with chopped fresh chilies and soy sauce on the side ('Heresy!' some readers will hiss). 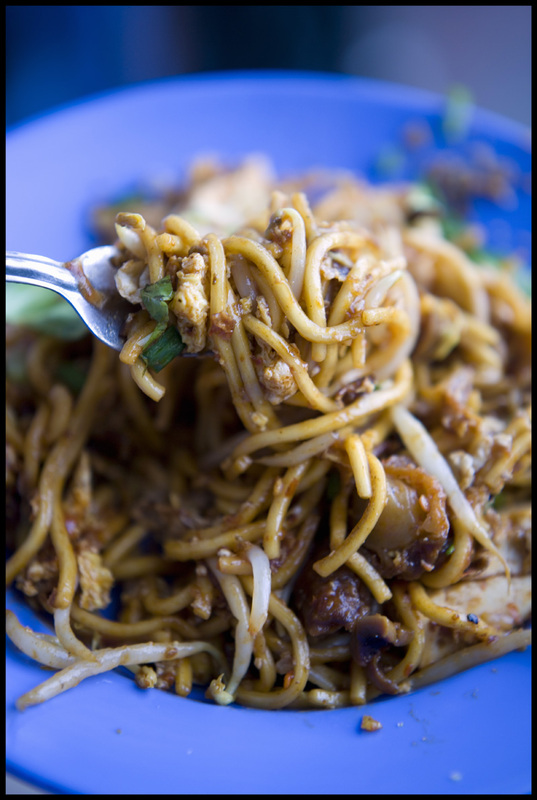 Well soaked in soy sauce, it evinces a characteristic char koay teow smokiness. The optional fried egg crown (or, if you prefer, side order) may seem a gilding of the lily, but the runny yolk makes it an inspired addition to a classic. 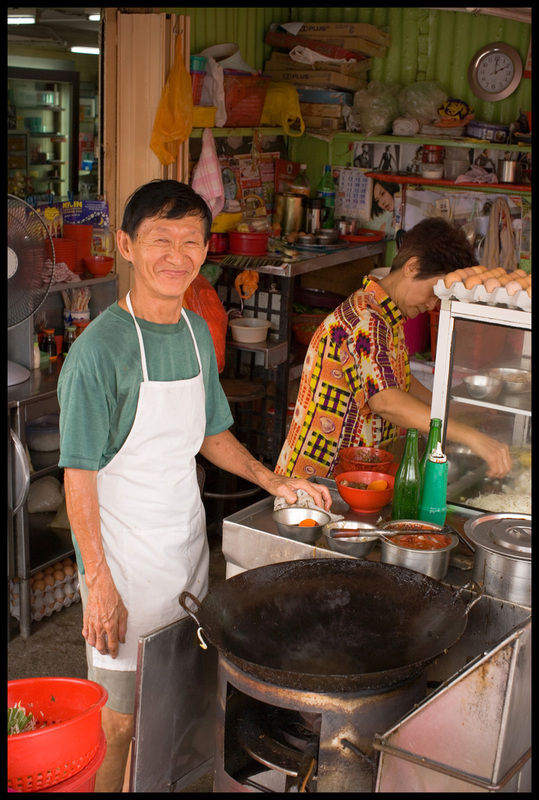 This vendor's been doing it (char koay teow, that is) his way, with a recipe and at a stall inherited from his father, for over thirty-five years. You know what they say about practice. I've gone over to the dark side. Until the next unparalleled dry version lands in front of me, that is. Char koay teow stall at Restoran Theng Wah, Jalan Klang Lama (across from Taman Bukit Desa), Kuala Lumpur. Morning to early afternoon. 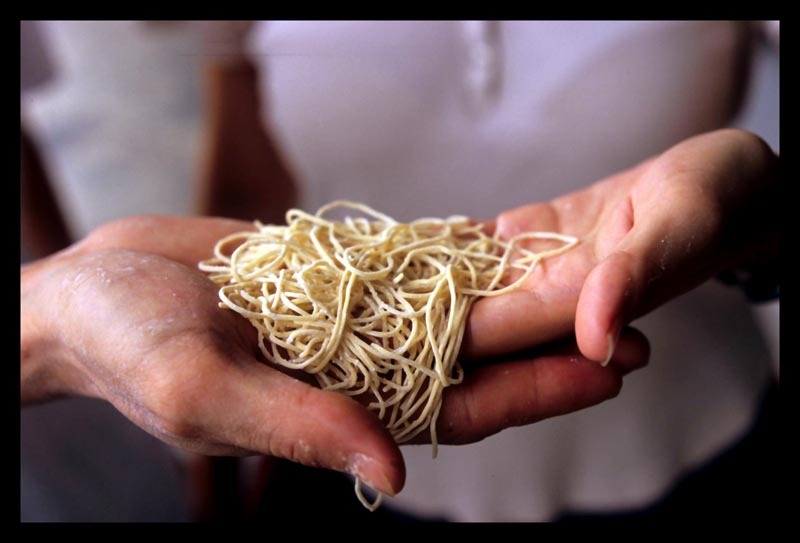 There's a problem with nostalgia, culinary or otherwise: it's only half-rooted in reality. The rest is idealized re-imagination - so encounters with whatever one is nostalgic for are bound to disappoint. 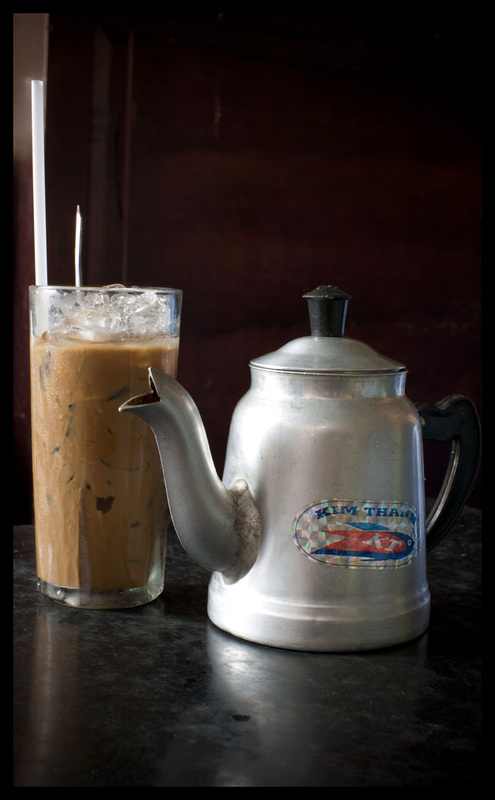 We returned to Saigon prepared to be, at least a little bit, underwhelmed. But we weren't, not once. We found the flavors of the city's streets to be, if anything, brighter, bolder, and altogether more captivating than we remembered. Case in point - banh chuoi, a simple banana cake. But not so simple. 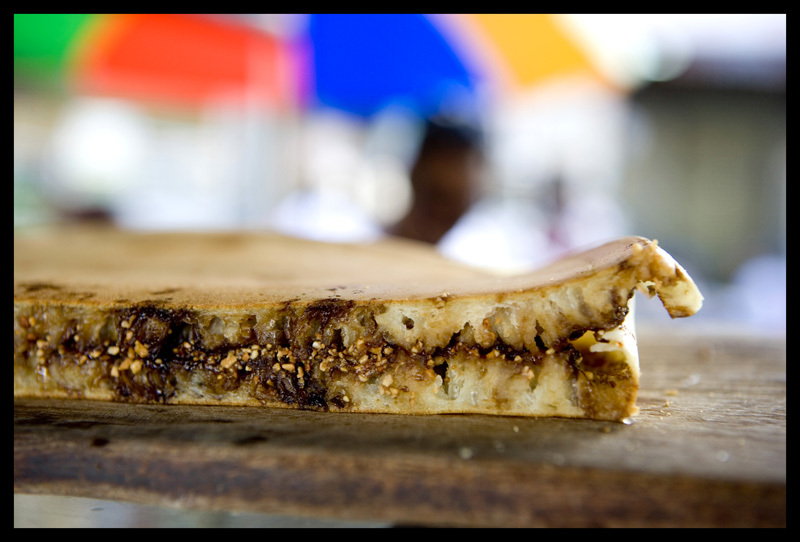 The Vietnamese culinary repertoire has multiple versions of banh chuoi; some are sticky with glutinous rice flour, others dense and seemingly flourless, while still others resemble the cakey banana bread made with gone-black bananas that we grew up with in the States. 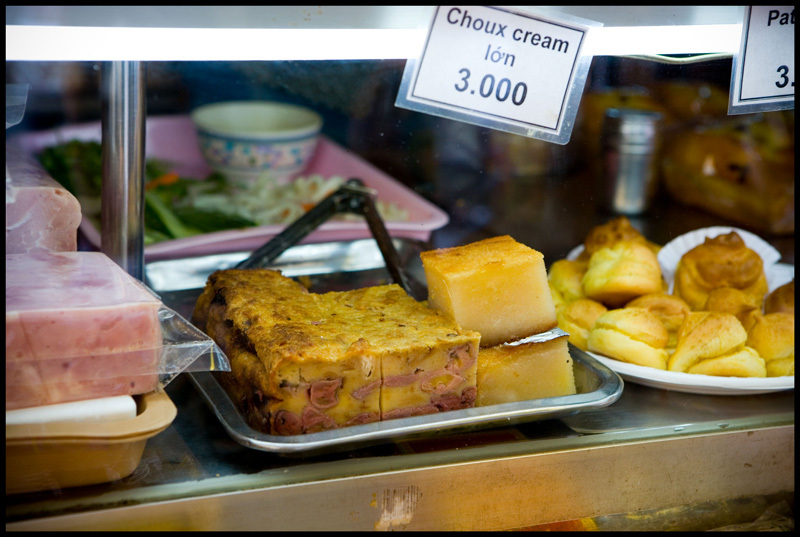 The banh chuoi we'd been savoring in our minds' eye is more French-ish bread pudding than cake, and made with a variety of low-starch, strawberry-fruity banana that turns pink when it's cooked. 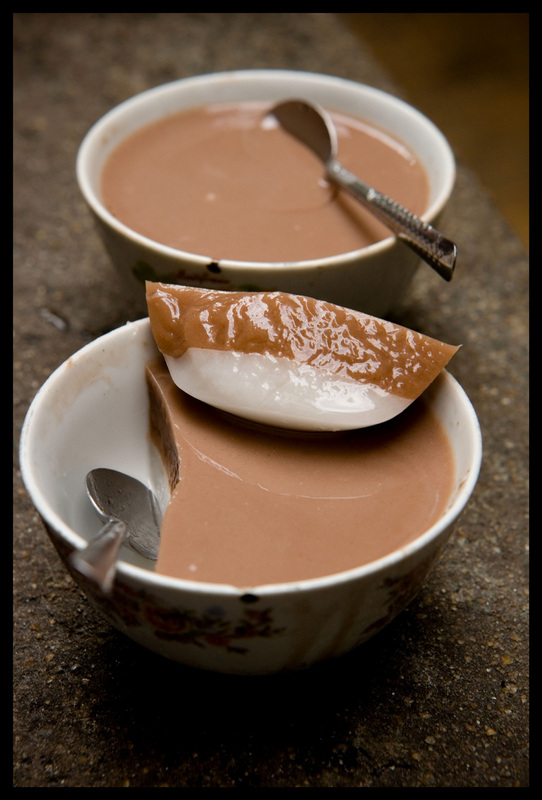 Throughout our first year in Saigon we bought slabs of the stuff from a stall at Ben Thanh market and ate them after dinner with dollops of local full-fat cream so thick it didn't require whipping. Then the stall closed. Occasionally we unearthed other versions of pink-banana'd banh chuoi around town, but none to compare with our first love. 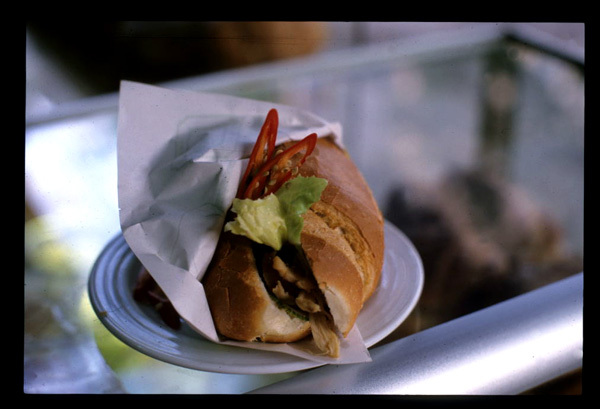 So, you see, we were nostalgic for banh chuoi before we even left Saigon, and, as we contemplated returning, not at all hopeful that we'd find a version that lived up to our fantasies. 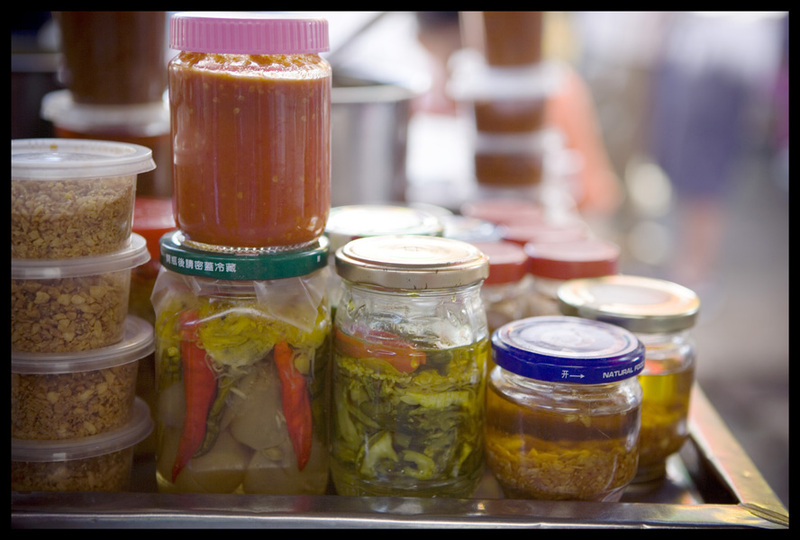 We weren't looking for it a couple of weeks ago as we wandered the prepared food section at Tan Dinh market. Then, suddenly, we struck a banh chuoi bonanza. The version up top was the prettiest of the lot, nestled, as it was, amongst a cache of tropical-hued glutinous rice cakes. 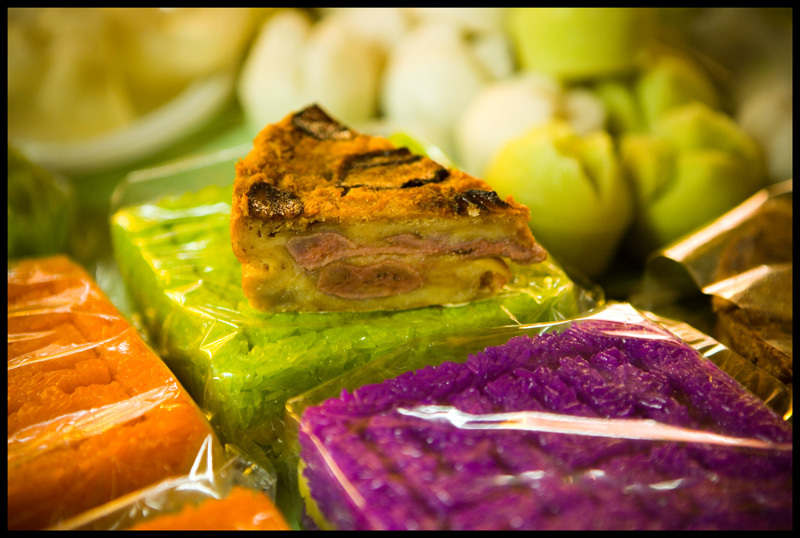 It promised - with its formidable height, thick slices of barely-blushing pink bananas, and crackly surface sporting nicely caramelized fruit slices - banh chuoi bliss. But its texture, bouncy from glutinous rice flour, disappointed. This was not the soft, yielding banh chuoi of our dreams. 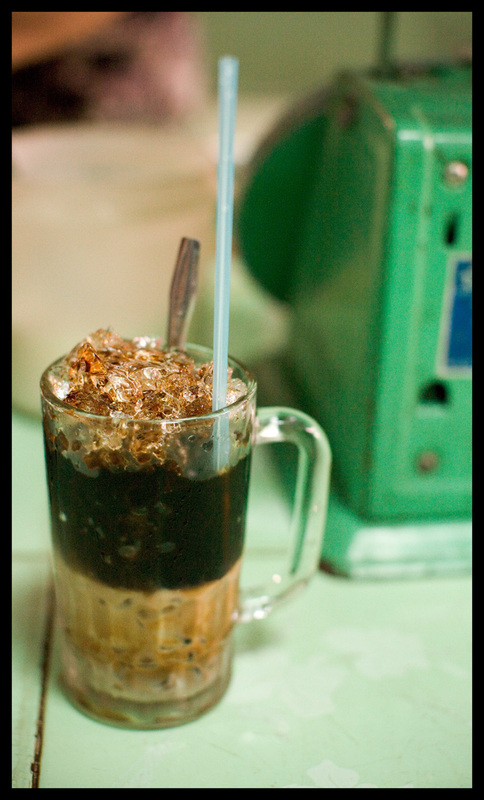 Then, euphoria - an ugly duckling of a banh chuoi (above) that sent us into spasms of ecstasy. Those chunky, pale squares of banana cake may not have elicited swoons on sight, but with their dense, buttery-eggy half-cake half-pudding swaddling tender chunks of pink bananas bursting with tart-sweet strawberry flavor, they came through in the end. Every bit as scrumptious as we remembered, even without the full-fat cream. Score one for nostalgia. Pink banana banh chuoi, food court, Tan Dinh morning market, Saigon. 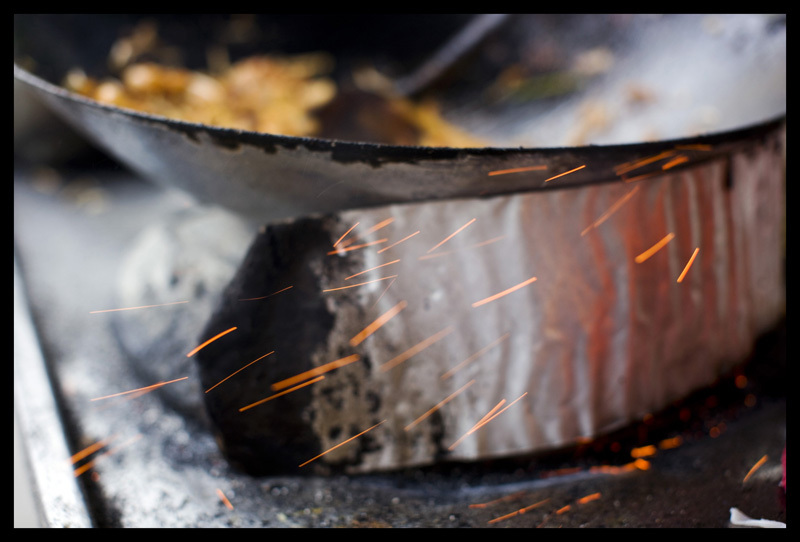 ...there's good eating - especially in Penang, where the art of cooking (not just grilling) over charcoal is alive and well. 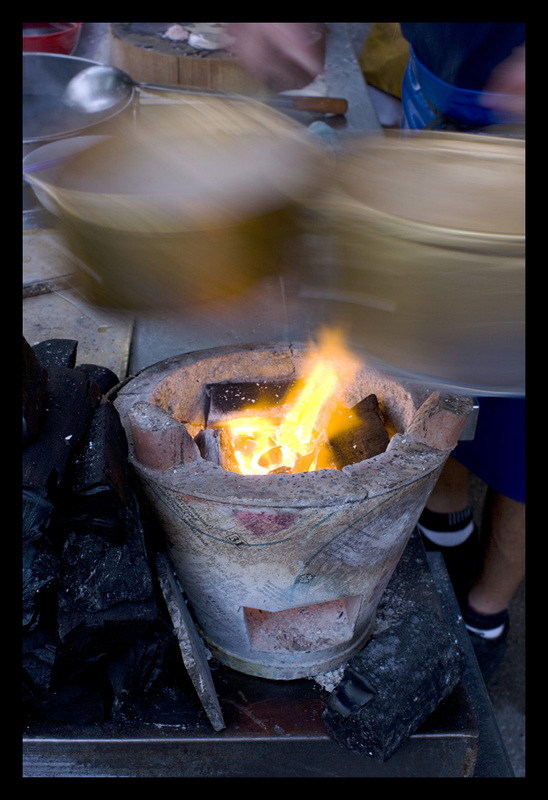 Our article on charcoal cooking in Penang appeared in yesterday's (November 22) South China Morning Post. If you're a subscriber you can check it out online. If you're not, enjoy these photos that didn't make the final cut. 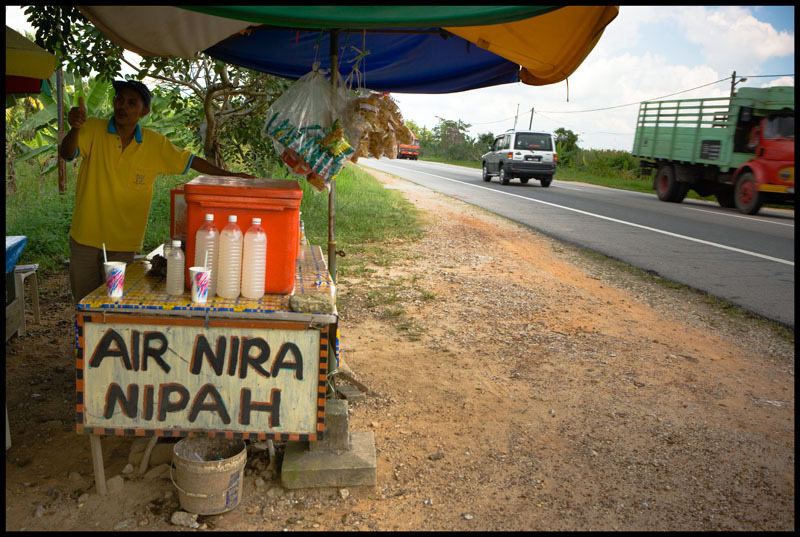 Heading northeast on highway 58, in the Malaysian state of Perak, we encounter a stretch of roadside stands hawking air nira nipah - nipa palm sap. 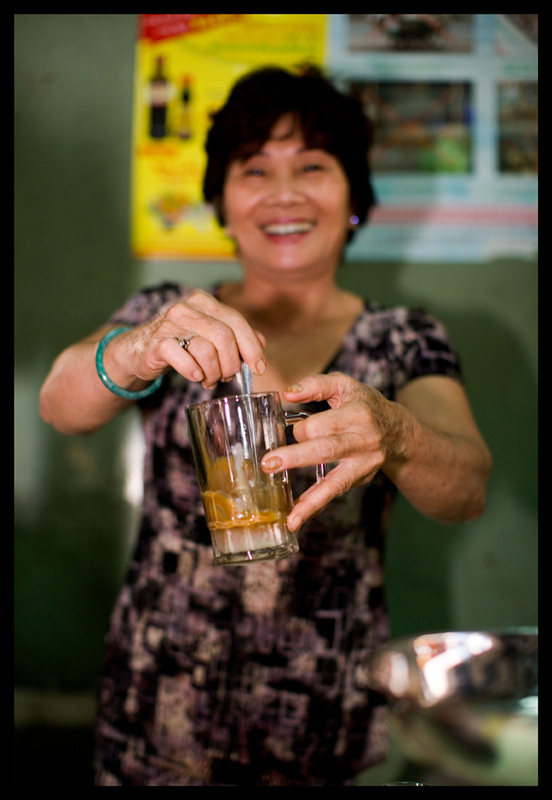 We know that palm nectar is drunk in southeast Asia, fermented and mildly alcoholic (sometimes called 'toddy'), and in a version distilled and much stronger. But fresh sap sold as a beverage is something new to us. 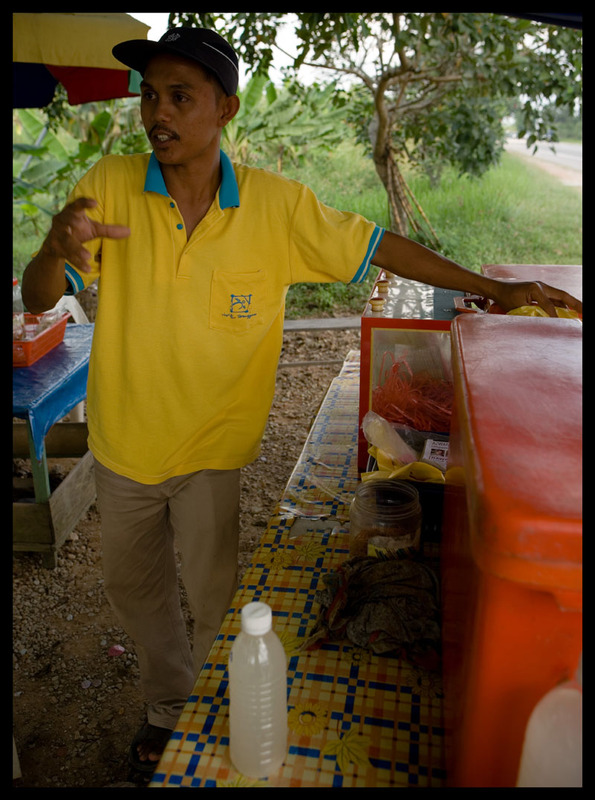 The vendors along this stretch of highway are clearly Malay, so we know that what they're peddling will have about as much kick as a glass of water. This cluster of air nira nipah stalls is explained by Sungai Dedap, the river we've just driven over. Brackish water-loving nipa palms grow on riverbanks and in mangroves. As we backtrack over the river later in the day we keep an eye out and, sure enough, both banks of the river are crowded with squat, multi-trunked nipas. Nira - which refers to the sap of any palm, not just the nipa variety - is collected from the tree's immature flower buds. It begins to ferment as soon as it leaves the bud for the collection vessel. Some collectors who plan to make sugar from the sap drop a tiny piece of kulit gelam (bark of the cengal tree) into the container to inhibit fermentation (other methods are used as well). 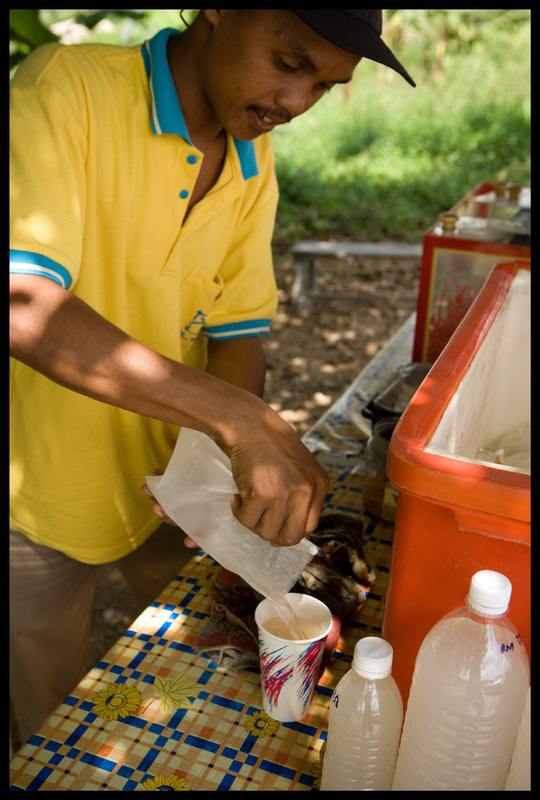 Ever on the palm sugar trail, we ask if any nipa sugar is being made in the area. The vendor looks at us like we're crazy. Sugar from air nipa nipah, he asks? 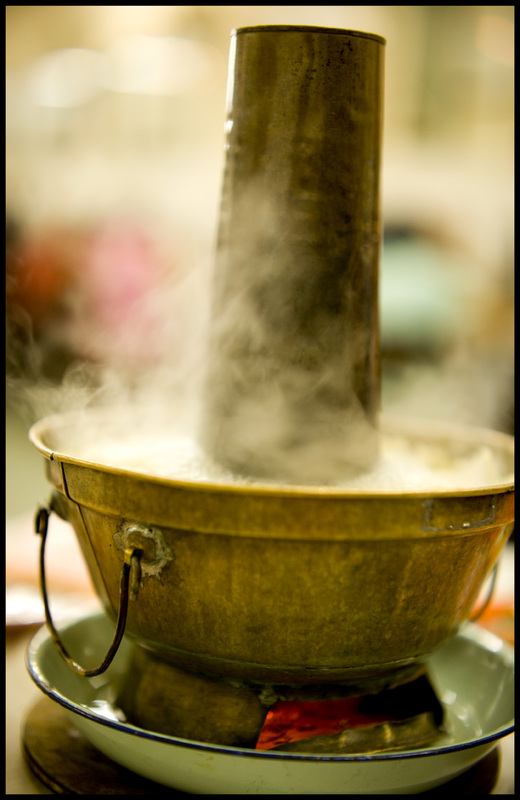 Yes, we tell him - in Sarawak (on Malaysian Borneo) locals use the liquid to make semi-liquid gula apong. We'll have to deliver a sample to him next time we're up highway 58. What, we wonder, does he do with his leftover nira? 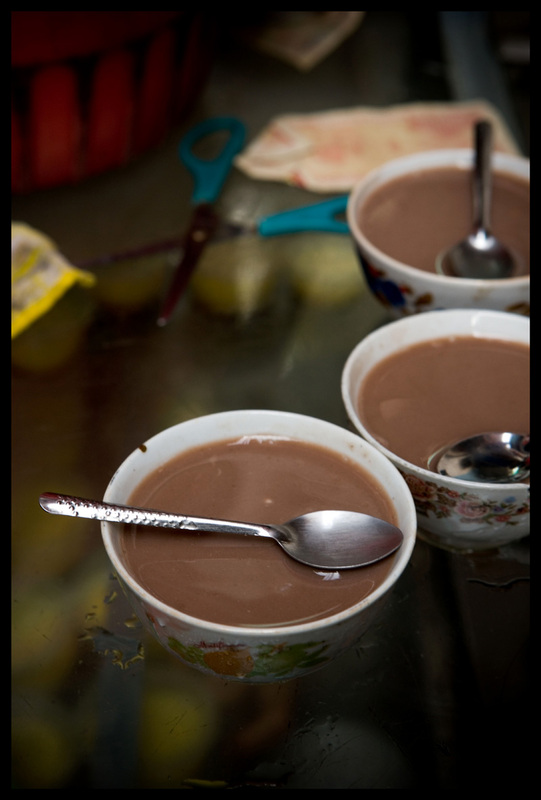 He points to the bottles of milky liquid in front of him (above and opening photo): cuka, or vinegar. Palm vinegar (made from both coconut and nira palms) is a Philippine kitchen staple but less commonly seen in Malaysia. Its smell is off-putting - strong enough to stink up the car, slightly alcoholic - but the taste is mild and intriguingly complex, like no Western vinegar we've ever tasted. He recommends sprinkling it over barbequed fish. Another nira and cuka vendor we speak with later in the day describes mixing the vinegar with chopped chilies, garlic, and shallots and sprinkling it over fish that's headed for the steamer. 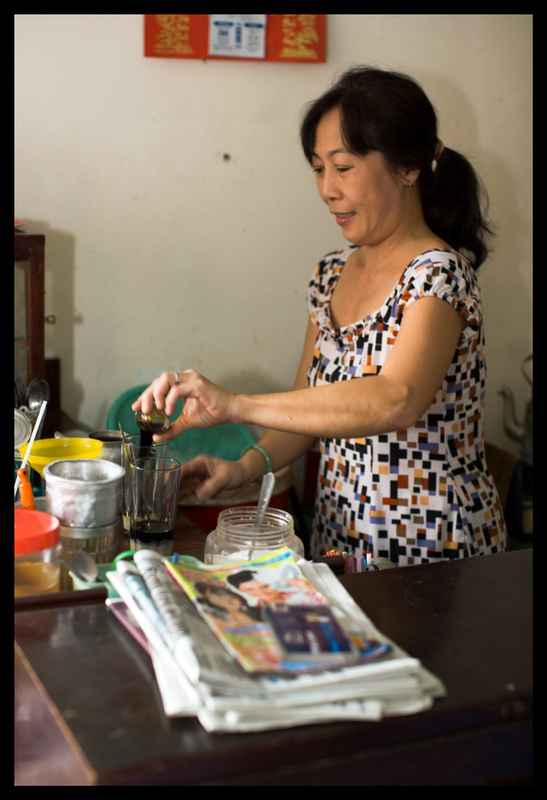 Her husband takes a spoonful a day, straight - good for high blood pressure, he says. Air nira nipah, highway 58 just north of the Sungai Dedap, Perak, Malaysia. I had forgotten how loud Saigon is. The deep-throated rumble of the motorcycles that rule its streets makes sidewalk conversation all but impossible. At morning and evening rush hours that purposeful hum would literally shake the floors of our District 1 house (now, curiously, a trendy creperie). It's the kind of racket that rattles the bones, the sound of a city on the move from work to home to play and of a populace rushing from present to future. It's exciting, exhilerating, electrifying. Until, all at once, it's not. Narrow alleys offer respite for those in need of one bloody minute's peace. Pick a passageway barely wide enough to accomodate two motorbikes. Enter and walk, then turn a corner and go a bit further. Suddenly homogenous din is replaced by distinguishable sounds of daily life: the swish of a bicycle, the wail of a baby, the thwack of cleaver on chopping block, the clatter of cutlery against plate, the sales cry of an ambulatory vendor. 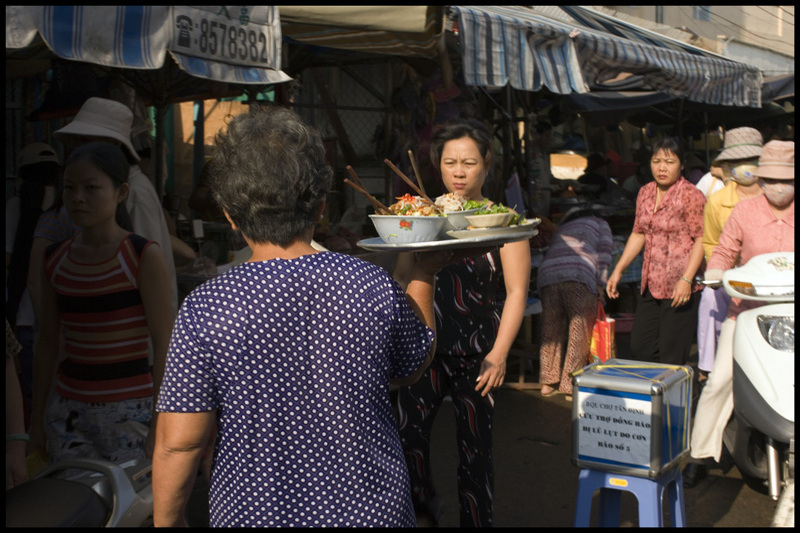 In spite of Saigon's headlong rush to 'modernization' men and women selling snacks from carts on wheels and baskets suspended from shoulder poles are still very much a part of the urban landscape. 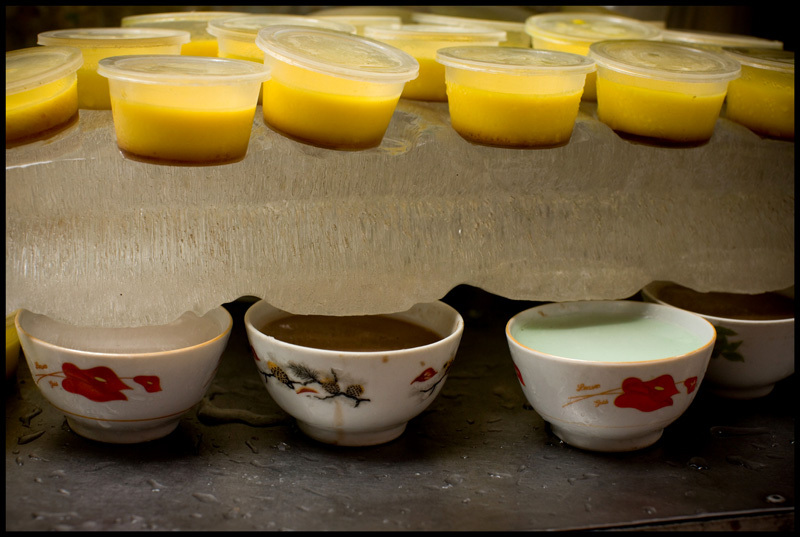 This woman peddles creme caramel and thach (cool jellies made with agar-agar) from a glass and steel cart. She's been in business twelve years and typically puts in twelve-hour days on the hoof. She keeps her sweets cool the old-fashioned way, with a single block of ice. As the day wears on the ice gradually melts onto the bowls of jelly underneath. Not a problem - their smooth, uncracked surfaces are impermeable to water. 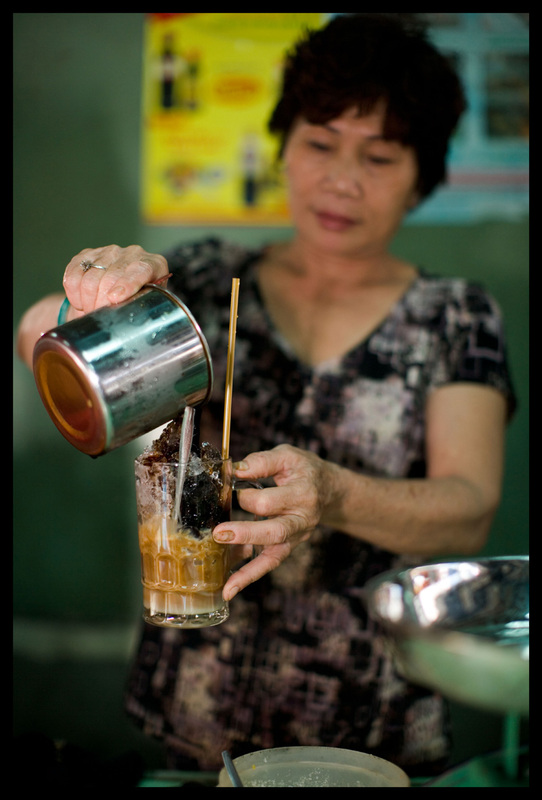 Her coffee jelly strikes a pitch-perfect note on this muggy afternoon. Silky and cool, it soothes as it slides down our exhaust fume-coated throats. Coffee and coconut flavors are true and clean, unmarred by excessive sweetness. Refreshing, in a word. 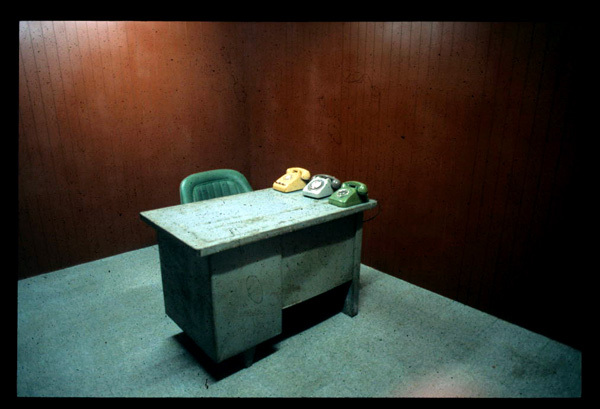 Revitalized, we take a deep breath and head back into the cacophony. 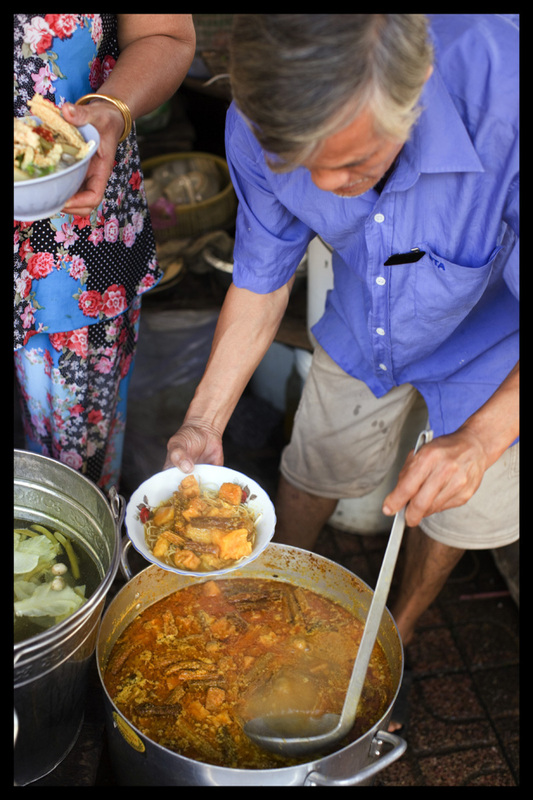 In Vietnamese cities one must be alert to the existence of hidden culinary delights - dishes cooked in kitchens and served from stalls all but invisible to the untrained eye. Working Saigon's Tan Dinh market one recent morning, we're made aware of the existence of one such enterprise when a tray-bearing woman emerges from behind the vegetable stall Dave is photographing. 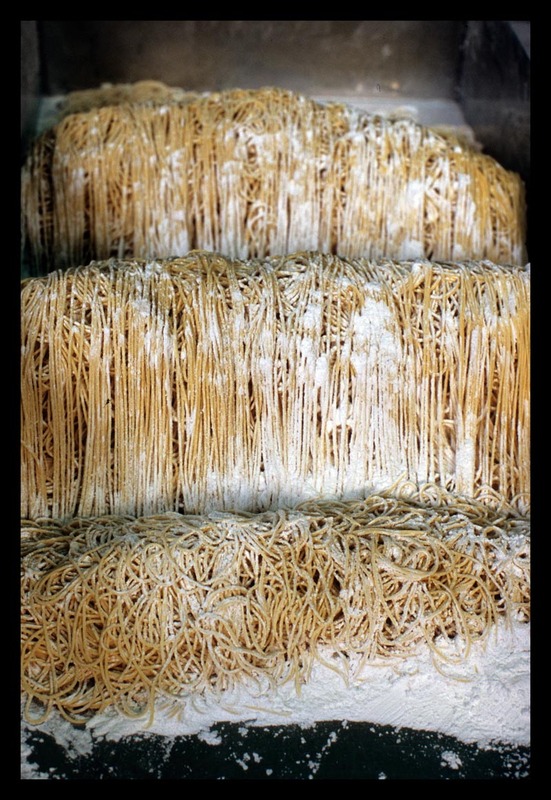 We eye the bowl of orange-tinted soup noodles balanced on her shoulder, and then crane our necks to peer behind the stall. Sure enough, people are eating back there. Stepping past the vegetable seller we find a family presiding over a splendid table. Today is the fifteenth (or the first, we're not sure which) of the lunar month, days on which many Buddhists abstain from meat. We're told by a regular customer that the fare served here usually includes pho and bun bo (rice noodle soup with beef), but today every dish is vegetarian. Scanning the groaning board we take in turmeric-tinted rice mixed with carrots and mushrooms and topped with roasted peanuts and cilantro; orange-sauced macaroni mixed with chopped fresh herbs and sliced tofu; plump fried spring rolls; crispy-skinned fried tofu served with chili-soy dip; assorted pickles; rice vermicelli in a clear broth packed with vegetables. 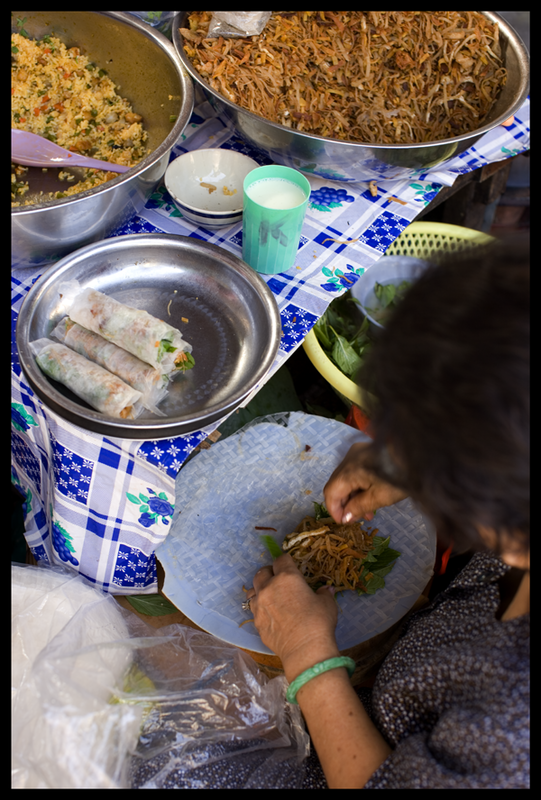 As dad serves seated customers and his daughter collects money and tends to take-away orders mom, perched on a low stool at one end of the table, piles basil leaves, cooked bun (rice vermicelli), pickled radish, lettuce, and tofu onto rice wrappers and rolls the lot into neat translucent logs. 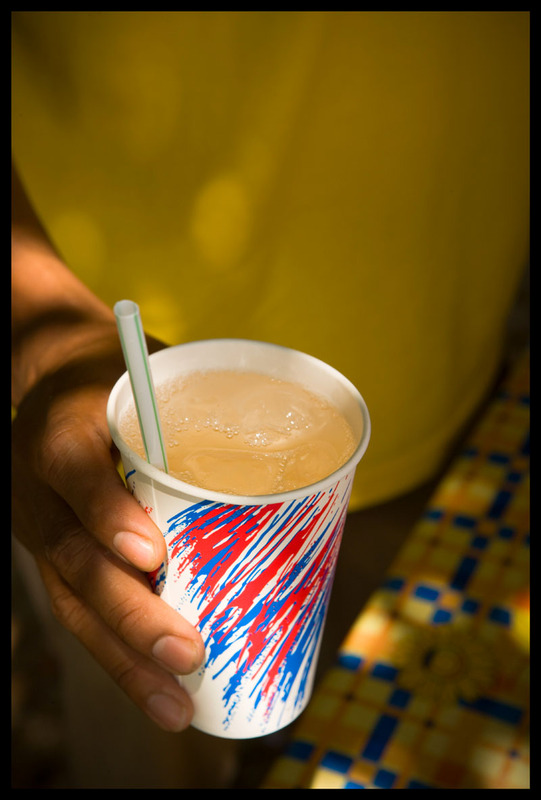 We opt for a couple of these, as well as a bowl of the sunset-hued noodle soup that led us here. After telling ourselves that the stall's low-to-the-ground stools with seats the size of a dinner napkin cannot possibly accomodate our American-sized posteriors, we take a deep breath and sit anyway. Elbow-to-elbow with our fellow diners, we hang our heads over our bowls of mi kari (yellow noodles in a curry-flavored soup) and breathe in their fragrant steam, then pull our faces back to admire the casual beauty of the presentation (opening photo). The pumpkin-colored broth, with its yellow chunks of potato and tofu and mahogany sticks of gluten, crowned with vivid green rau ram (Vietnamese coriander) and basil, chopped red chilies, and a pinch of coarse salt present a tableau that a professional food stylist would have difficulty improving upon. Meat is not missed. 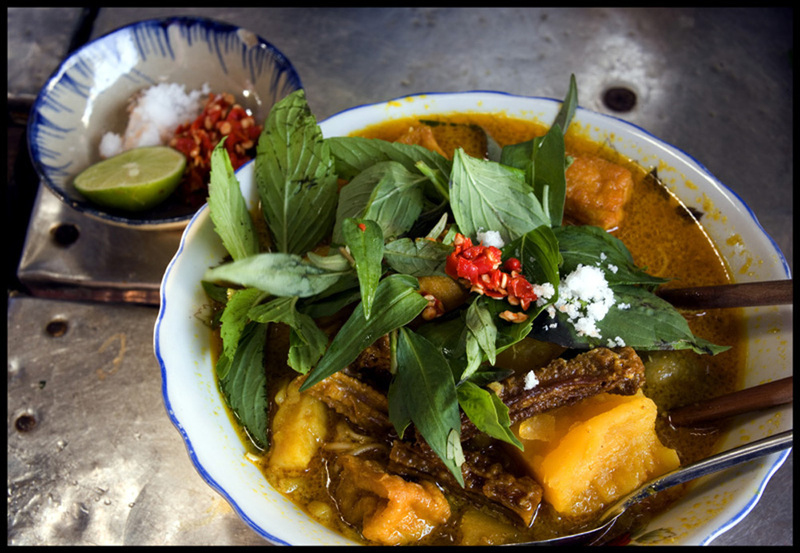 The thin but rich broth is Indian and Vietnamese all at once, ground chile and coriander and turmeric and cloves sweetened to the southern Vietnamese palate and tweaked with pungent fish sauce. 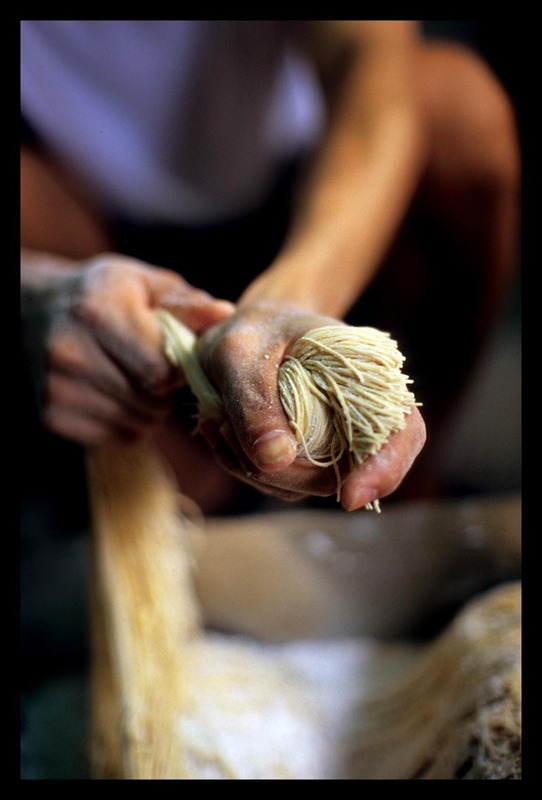 Stirred under, herbs add the fresh lightness so characteristic of the country's cuisine. In our mouths the soft bun, chewy tofu, and crunchy lettuce of the rolls spar to delightful effect. We finish every last drop, and the vendor is pleased. (We also garner a few thumbs-ups from customers at another table.) Following the example of others who've finished and departed before us, we extricate ourselves from our tight spots by remaining seated while pushing our stools backwards, then popping up once our knees are clear of both the stall's tabletop overhang and the shoulders of fellow diners. 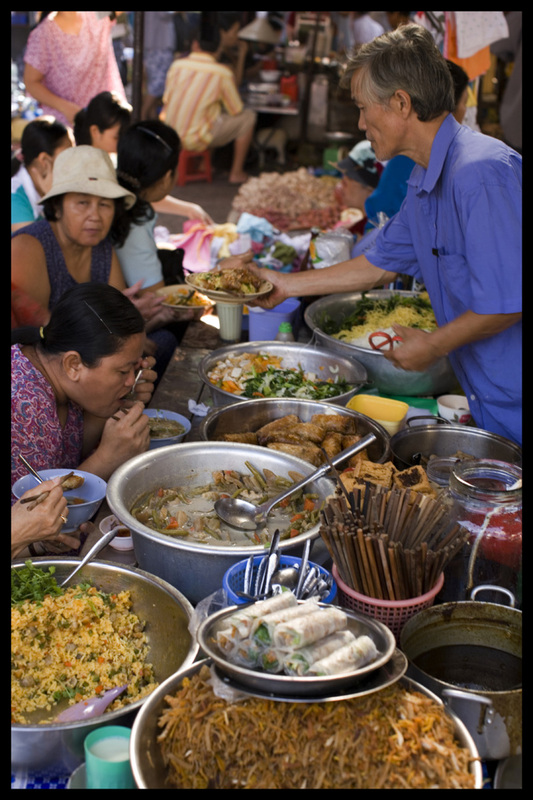 As we're paying our miniscule bill a woman bearing a bowl of soup noodles crowned with a fat fillet of fish and accompanied by a plate heaped high with shredded banana flower and morning glory stems appears from the mouth of a narrow alley. We walk over and peer into the dimness. Sure enough, people are eating back there. 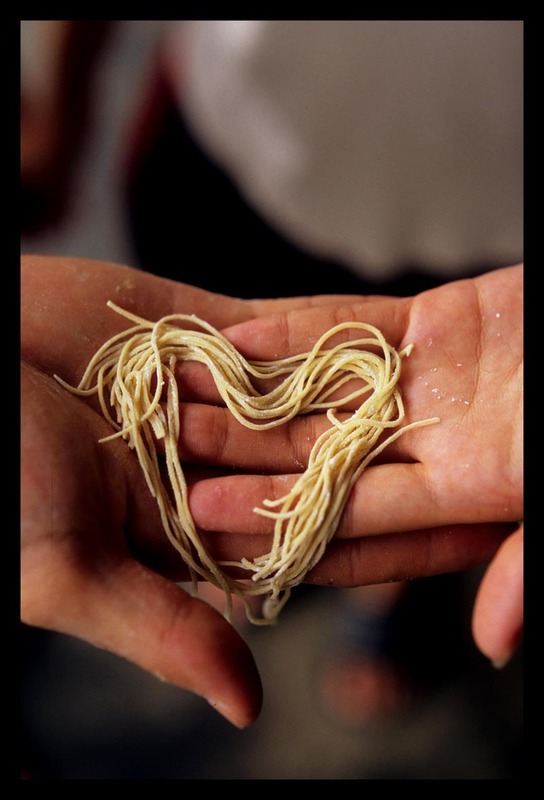 And from the looks of that bowl of noodles, they're eating very well indeed. 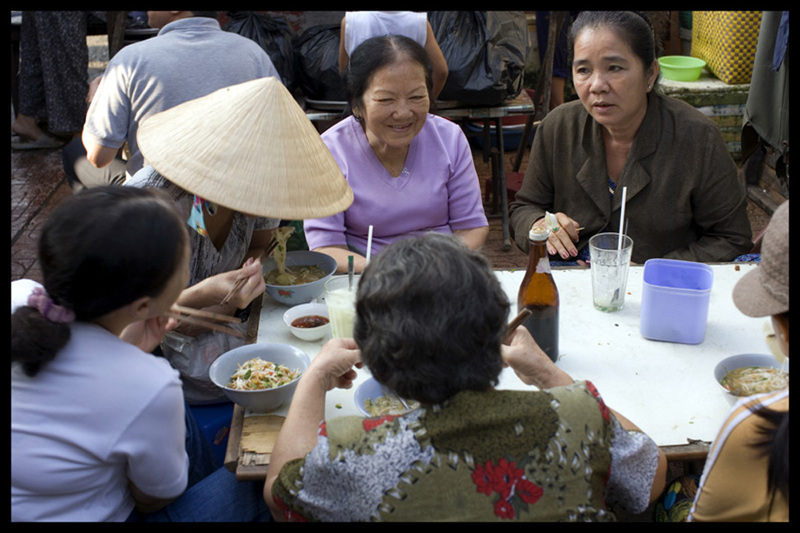 Tan Dinh market food stall - no address, no phone. 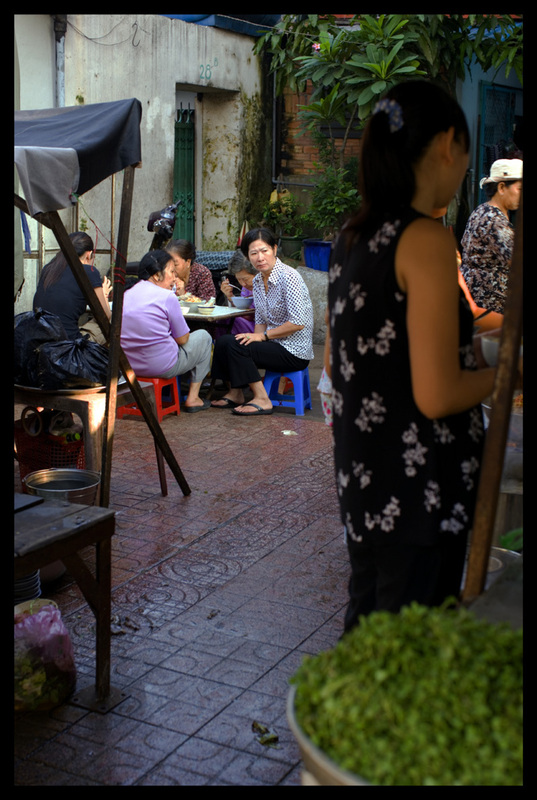 Head for Tan Dinh market in the morning, cruise the street behind where the fish, vegetable, and noodle sellers are, and keep your eye out for women bearing trays of noodles. It's been more than two years. It's time we got re-acquainted. 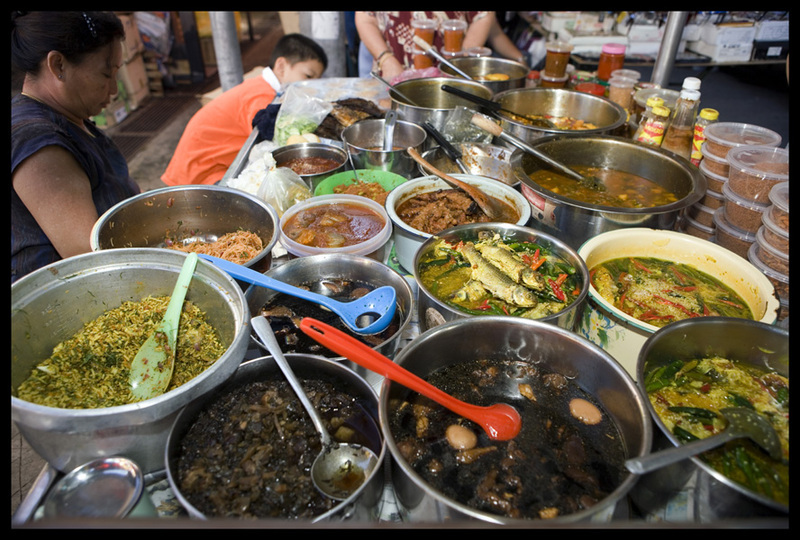 It is said that the best Nyonya food in Penang is found behind closed doors, made in private kitchens and served in private homes, ever out of the reach of tourists. This may well be true, but that doesn't mean that all of what's sold to the general public is mere second-rate slop. 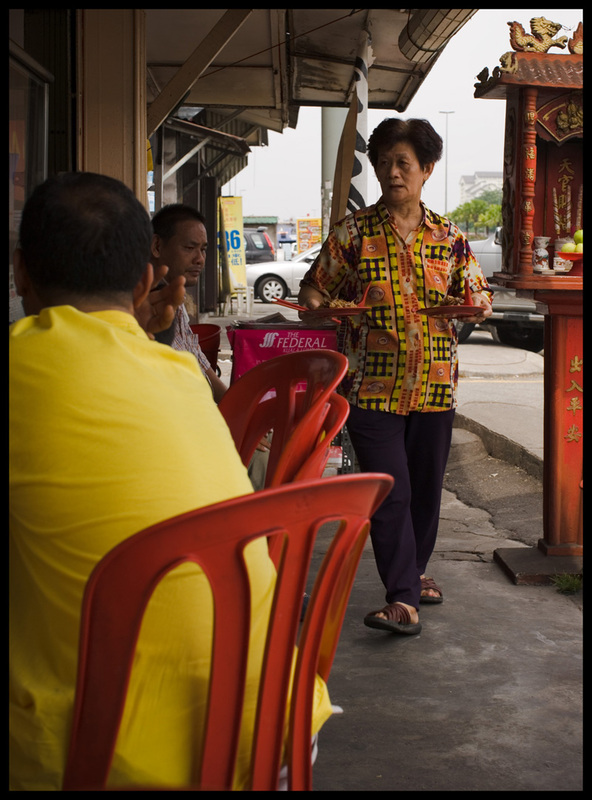 This vendor has been pedddling her Nyonya dishes at Pulau Tikus market for some thirty-plus years. Her days are long (or her nights are short, depending on your perspective); she begins preparing the day's dishes at 1am. It's an amazing - and, for anyone not in possession of four stomachs - extremely frustrating assortment. How to choose between acar hu, chicken curry kapitan, nasi ulam, kerabu beehoon, otak-otak (steamed fish 'custard', similar to Thai haw mawk), tau eu bak (pork stewed in soy sauce), or any of the other other stews and braises on offer .... let alone the endless array of pickles and preserves and sambals precariously balanced on the cart's front edge? Takeaway-in-a-plastic-bag is the standard modus operandi here, but she'd already teased us to near desperation with a sample spoonful of this and another of that. We wanted to eat now. Noting our fervent nods and happy grunts, she smilingly pulled a couple of styrofoam containers out from under her cart, borrowed a table from the vendor behind her, and, pointing at a couple of stools, told us to sit. We proceeded to fight first over her nasi ulam - an exquisite mixture of dry rice, toasted coconut, salted fish, and slivered fragrant greens including lime leaves, daun kaduk (wild 'pepper' leaves), and daun ciku, the leaves of the sopadilla tree - and then, her acar, a spritely mixed 'pickle' made with pineapple, cucumbers, and peanuts. 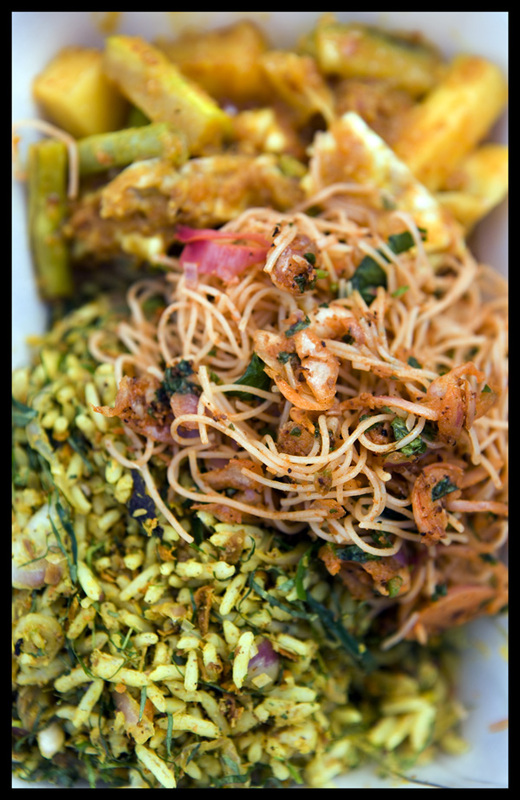 The kerabu beehoon fell a bit flat for us if only because we'd eaten what may be Penang's ultimate kerabu beehoon earlier that morning. Less lime juice, chili heat, and fish flavor from belacan made this version a bit one-dimensional, we think, though it might appeal to those not quite as fond of spicy fishiness as we are. 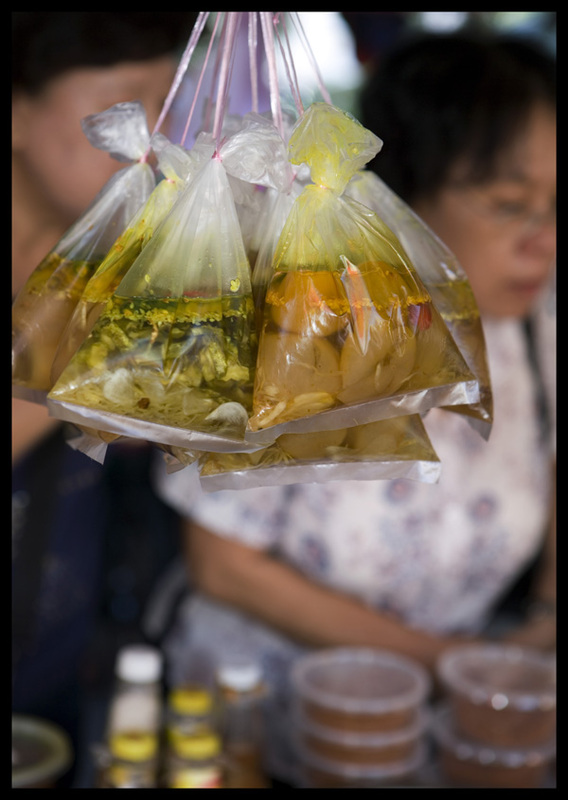 Fish 'preserved' in vinegar is a dish found around the world - think sarde in soar (Venice), West Lake fish (Hangzhou), fish paksiw (Philippines). 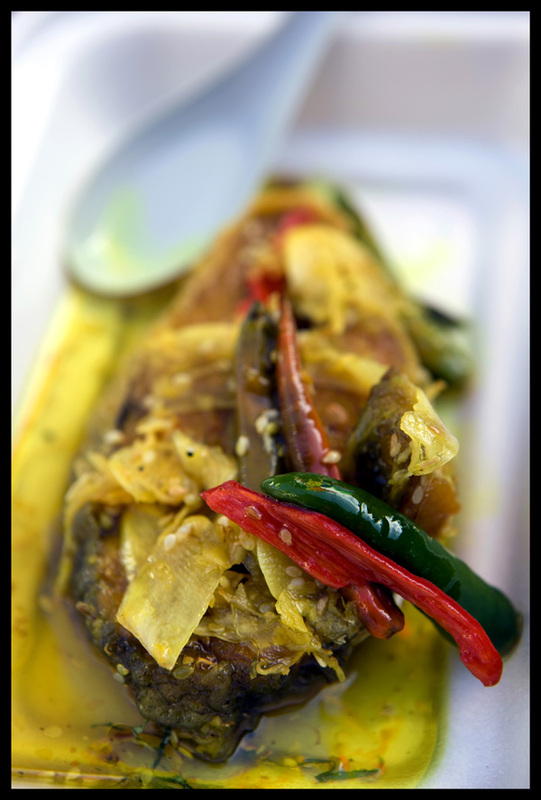 Acar hu, Penang's Nyonya version, comprises deep-fried whole fish (or fillets) doused with a turmeric-tinted sweet and sour dressing, and also includes onions and fiery whole chilies. 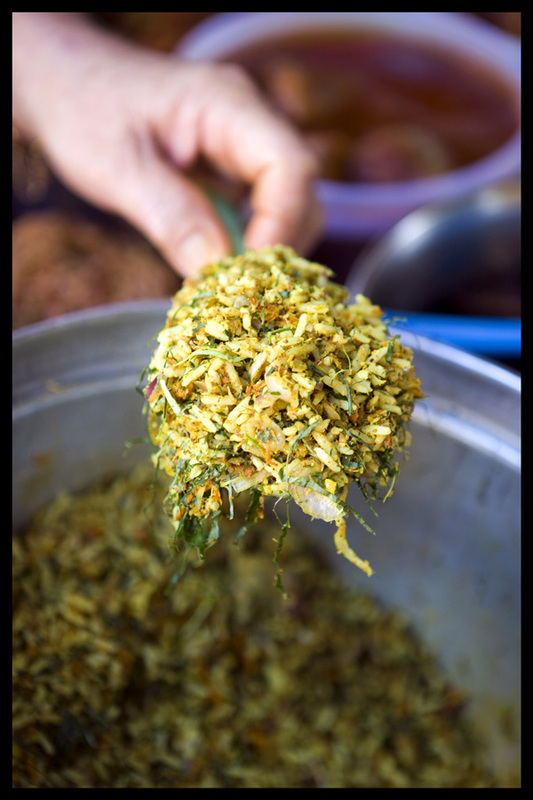 A good acar hu derives not just coloring from turmeric, but a good bit of earthy flavor from it as well. We chose a fillet for ease of eating and loved the moist flesh enclosed in a still slightly crispy crust (opening photo), though given a choice we might have gone with a bit more vinegar. The most surprising taste at this stall was the pickled lime that offered to us as an afterthought (bag on the right, above). The vendor dries regular limes in the sun until they turn white, steams the dried, shriveled fruits, and then puts them in a pickling solution. The result is as delightful as it is difficult to describe - sour, certainly, but not overpoweringly so; fruity, in a back-note, understated sort of way; pleasingly astringent. 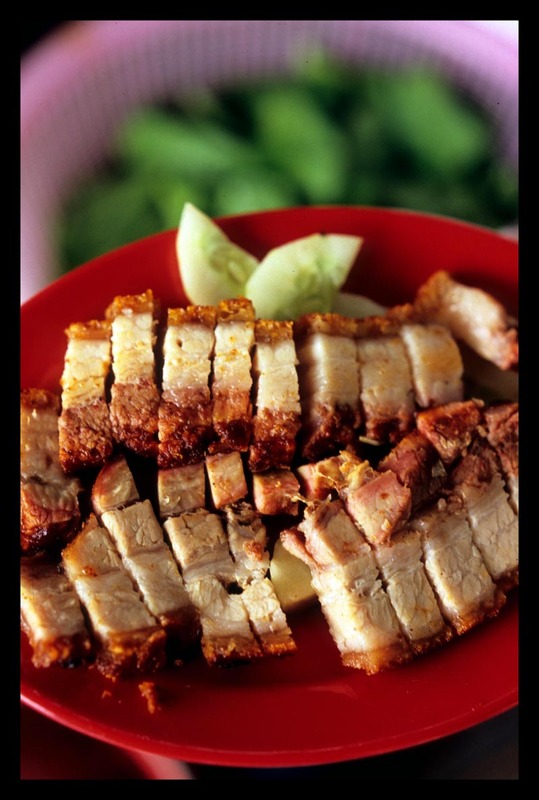 In short, the perfect to a Nyonya stewed meat or fish dish. This stall is a Pulau Tikus treasure. The next time we're in Penang we'll head back on empty stomachs, armed with plates and proper, sturdy silverware, and dive into some in-depth grazing. 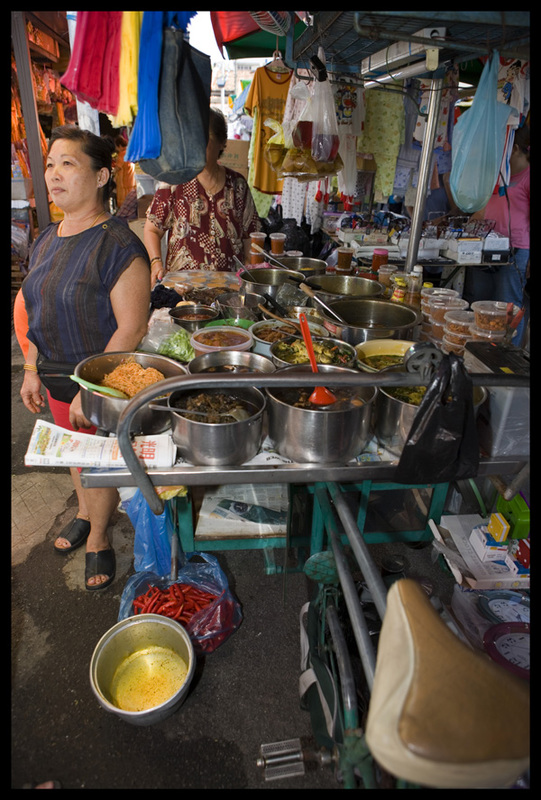 Nyonya stall, outside Pulau Tikus market building, 7am-12pm daily.